The company Easymile and the research lab LAAS-CNRS, located in Toulouse, are partners in the SafeBus collaborative project funded by the Occitanie region (South France). Easymile is developing an electric driverless shuttle dedicated to smart mobility for short and predefined routes in multi-use environments, e.g. private roads in large industrial sites, or specific lanes on urban roads. The EZ10 vehicle is already tested in several sites in the world (Paris, Singapour, Sweden, Australia…) to offer an innovative shared transportation solution for short distances (the “last mile” scenario): because it must execute motions in human environments, a critical constraint concerns the safety, i.e. the detection and the avoidance of obstacles which could be either static on the vehicle trajectory or mobile with a collision risk. For more than thirty years, many solutions have been proposed for transportation or robotics applications, involving several sensors. The EZ10 vehicle is equipped with many sensors: 2D or 3D lidars, radars, cameras… Simple and safe functionalities are already integrated so that the vehicle stops as soon as an obstacle is detected close to its predefined road. The SafeBus project aims at improving these functionalities, making lower the false alarm rate and proposing an avoidance strategy for well specified situations. It will be proposed a multi-sensory solution, combining laser and visual data in order to detect, identify and track obstacles, estimating their positions and speeds. The work of LAAS-CNRS will be mainly devoted to obstacle detection from stereovision. Start date if possible: June 2017. The Gepetto team , the research of which focuses on humanoid robots, is developing its flagship open-source software: Humanoid Path Planner, or HHP . 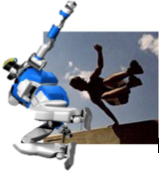 It is used for planning and synthesizing the motions of robots and 3D virtual characters. As of today, HPP has reached the maturity allowing its use within associate academic projects, as well as industrial applications. - On a daily basis, work in collaboration with Gepetto team members so as to implement new algorithms and demonstrate them for scientific publications. The activities of the engineer therefore essentially include software architecture and C++ development, as well as the implementation of demonstrations that will run both on virtual simulations and real robots. The engineer will also be in charge of animating the community of users on HPP, in strong interaction with the team members. - If professional experience is preferred, all applications will be considered, and the candidate motivation and autonomy will be equally important in the selection process. Located in the University town of Toulouse, in the south-west of France, the Gepetto group belongs to CNRS-LAAS, laboratory for the analysis and architecture of systems, a 640 man-strong research center with about 90 people working in robotics. The laboratory is one of the few in France to possess a human-size anthropomorphic robot, HRP-2. The members of the Gepetto team have received many distinctions for their work , and collaborate on a regular basis with the industry , other internationally renown academic researchers , or artists . Wage: 2296,62€ to 2965,68€ before taxes, depending of the candidate experience. Type of contract: “CDD” : one year contract, which can be re-conducted for another year.